The West Virginia Nonprofit Association (WVNPA) held their Fourth Annual West Virginia Nonprofit Leadership Summit in partnership with Volunteer West Virginia on September 25 – 26 in Davis at the Canaan Valley Resort and Conference Center. Over 210 people attended the conference. Beth Kanter, a well-established international nonprofit thought leader, writer of Beth’s Blog, one of the longest running and well-known nonprofit blogs, and author of three books including The Happy Healthy Nonprofit: Strategies for Impact Without Burnout, gave the opening keynote address. The closing address was given by Rebekah Mathis-Stump, Chief Operating Officer at Ethos Leadership Group, LLC in Parkersburg. Attendees of the Summit dined and networked at local restaurants and attended group sessions and workshops on serving nonprofits and strengthening West Virginia. For the third year in a row, the WVNPA presented the West Virginia Nonprofit Excellence Awards during the Summit. Sponsored by the Parkersburg Area Community Foundation, these awards were created to recognize the outstanding accomplishments of West Virginia nonprofit organizations and increase awareness of the impact of the nonprofit sector in communities throughout the state. Awards were given in three categories: small organizations, medium-sized organizations, and large organizations, according to budget size. 21 West Virginia nonprofit organizations submitted applications to be considered for the awards. The winning organization in the small budget category was Good Shepherd Interfaith Volunteer Caregivers based in Shepherdstown. Good Shepherd promotes independence to seniors and those of all ages living with disabilities through volunteers. Their services include transportation to appointments, equipment lending, home repairs and handicap renovations, and will calls and visits. They also provide dementia education and support services for family members caring for a loved one with dementia related disease. WVNPA Executive Director Laura Lee Haddad was impressed with the field of applicants for this year’s awards. “Everyone on the selection committee was excited about the caliber of applications we received this year,” Haddad remarked. 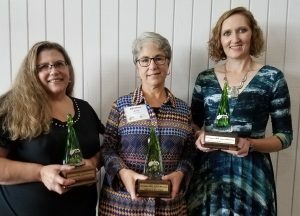 “It’s just a small example of the great work that nonprofits do in this state.” Winners were announced during the opening session of the Summit, and representatives from each organization were given beautiful glass awards created by West Virginia artisan Todd Turner of Appalachian Glass in Weston. With a growing membership of more than 315 nonprofit organizations, the WVNPA was founded in 2012 in order to serve nonprofits in the Mountain State. Membership in the WVNPA is open to all 501(c)3 West Virginia nonprofit organizations. The WVNPA is a member of the National Council of Nonprofits and serves as a clearinghouse for a wide range of benefits, services, best practices, and planning that strengthen the nonprofit organizations that make up a valuable part of West Virginia’s economic and community fabric.